The recent Tullamore Show was a great success for us despite the showers. 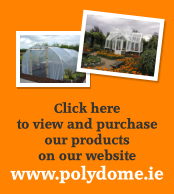 Great interest in our new zig zag rails which are a new low cost system for attaching polythene to the Polytunnels – around the same price as a Timber Rail but much more durable. The funny thing was the rain meant everyone dived for cover during showers so our Polydome Tunnel was full to capacity with a captive audience. The show is a great day out for the family.